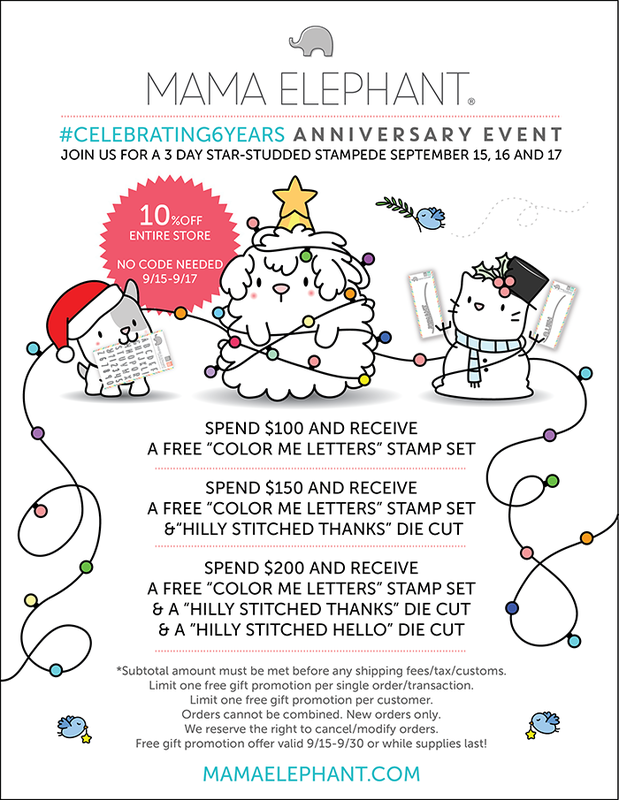 mama elephant | design blog: MAMA ELEPHANT September Anniversary Stampede - DAY 3! MAMA ELEPHANT September Anniversary Stampede - DAY 3! Hello and welcome to Mama Elephant's #celebrating6years Anniversary Release Stampede with our wonderful crafty friends and designers! The wait is finally over! The release is now live and available for purchase in the shop! Angela made this timeless kitty cat card. She used warm gray copics to achieve this look. She then stamped the string from the new "Trim the Tree" stamp set and added some flat golden sequins (or really big glitter! ;D) as tree trimmings. Watch it light up when you angle it to reflect light! So awesome! And that's a wrap to the 3 day mega stampede! Make sure you checked out Day 1 and DAY 2! Thanks all for joining us! The celebration continues all month long! Such a clever idea! WOW! I love the black, white, gray shading! THIS HAS BEEN The BEST RELEASE EVER! Thank you for the opportunity to win! I am already a follower on Twitter and will retweet! I am already a follower on Instagram and LOVE the inspiration! I need everything in this release.....it's all too cute!!!! Love this release.. It took me forever to lock in my choices! So much fun. Thanks. A hearty congratulations on this 6th Anniversary. The sample card is fantastic! I wonder if it's because I'm a cat lover. Nice job that Angela did. Love to see this monochromatic version! I'm in love with ME Christmas! I'm a facebook follower and I shared. Angela... you outdid yourself.. I love how you foiled them so they glimmer.. love love love. Oh, and I follow on IG / FB and Twitter. Brilliant and clever! Cool soft monochromatic look. The glimmer is a bonus. LOVE! This looks amazing. Love this pile of cuteness. Congrats ME. Wishing you loads of success. This stampede is so much fun, I am loving all the inspiration - it makes you look at the stamps and dies through the eyes of so many different artists, and shows off the versatility of the goodies - LOVE IT! I like your Facebook page,too! I love this in monotone. Cuteness. What a GREAT kitty card....makes me smile each time I see it!!! Thanks for the inspiration!!! Love the card as well as the entire release! I follow on Instagram b/c I don't want to miss any ME goodness. I will post a comment there are well. I follow ME on Youtube. I am an Instagram follower of ME. I can’t wait for my kitty tree!! I follow you on Facebook, Instagram and Twitter! 1. I'm totally in love for this adorable card!!! 3. Follow on Twitter and retweeted as raggiodiluce82 (Arianna Barbara). Love this adorable tree of kitties... what could be more fun? Love those kitties! So adorable and fun. I follow on Instagram & left a comment. The kitty stamp is so cute! Love the way it sparkles!!! What a creative card. Love the tone on tone touches. the kitty tree is darling. Loving the kitty cat card! Fun, fun, fun! i already follow on the other platforms really enjoy your work and Mama Elephant! So cute! Who couldn't love a whole pile of kitties? Love it! I follow on FB and Instagram but don't use Twitter. I am a cat lady!!! I just adore this stamp set and its colored beautifully. Adorable kitties! Love the bling! Omg the kitty Christmas tree is so cute! Ordered the kitties and doggies! So cute! I saw this card on Instagram and had to go through the blog hop and see all the other creative works! Love that it looks like actual holiday lights. The grey tones really let it stand out! Oh wow, cats everywhere!! ♥️ I love this card! Thanks for the inspiration! Awesome colors! This card is sooo beautiful! Thanks for the inspiration! And happy birthday to MamaElephant!!! Great anniversary release! I follow you on facebook. I promised myself "no more Christmas stamps," but now I "need" that Christmas cats tree! Love this card. Can't wait for my order to come in! 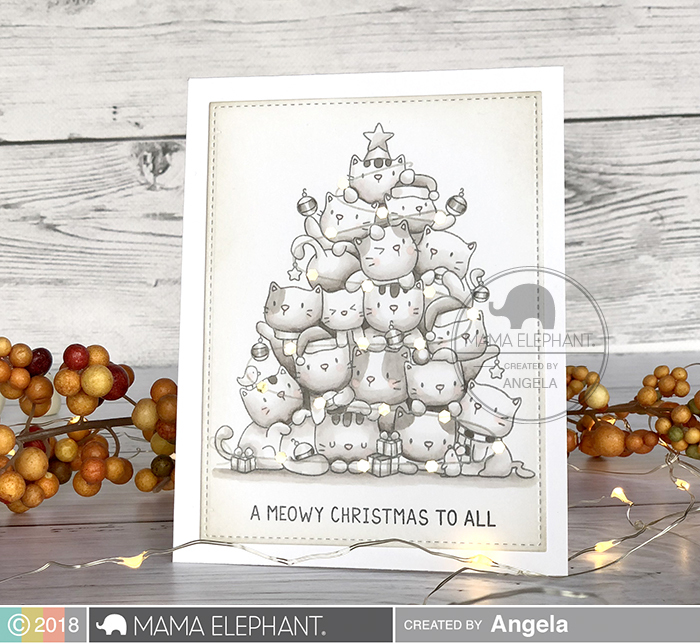 Cute kitty card in grey tones. Cute card! I like the subtle colors! I follow on FB, Instagram, YouTube, and Twitter! I love this in black and white - so adorable. This stamp is just adorable, especially for anyone who has cats. Yaay! Another day of beautiful holiday inspiration from Mama E! SQUEEEE! Such a cute & fun card! Really love the kitty tree! I am always a big fan of Mama Elephant. I follow you and like you on Facebook. I'm new but catching up fast....follow on FB and IG....so cute and I'm a dog person!!! Have been loving all of the inspiration! I got my shipping confirmation today and I can barely wait till it arrives! I already follow on FB, IG, and twitter, but I tried to spread the word on all of them! i now follow you on Facebook and here; i don't do IG or twitter. what a great new company for fun stuff!!! The great ideas and inspiration just keep rolling in each day with this hop. Great projects today! The tree of kittens is adorable! And am in love with all the new releases! Am your avid follower on IG, FB, Twitter and here on your blog!! Great new releases!! So so fun!! Love it! Really stunning coloring on this card. I'm a little intimidated by monochrome, but this looks so amazing, it makes me want to try. Happy 6 years, and all the congratulations! What a gorgeous atonal card! It takes a cute stamp and makes it look more classic, showing the versatility. I love this release! Thank you for the chance to win!! Love the sequins sparkles. What a great idea! Happy 6th Anniversary! Such an adorable stamp set and I love the neutral colors with the pop of the sequins! Great Cards! Love the new release. I love that card - just fabulous! That is so sweet in the soft grays! Love this! I love this card; like a lovely old photo! Can't wait for my kitties to arrive! I'm a total cat lady, so I love this adorable (and oh, so fun!) image and super fun card! Love how you used the greys on this card. Another day of adorable cards using adorable products. I just love this release. Very cute tree of cats! love the gold garland card! Oh Wow!!! I love this card!!! I love the grey kitties! The card is very striking with this monochromatic colour scheme! I have always liked ME on facebook! Great card and great new releases. lovely card - love these images - so sweet ... but I must say, had problems commenting on some of the designers blogs =( they all did such lovely work! I can't wait to get this stamp! Love it! Amazing card by Angela! Love the way the gold garland sparkles when it catches the light. Fabulous release for a fabulous company! Love the soft grey colouring of this one, its gorgeous!! Love those adorable Christmas kitties making the tree! Thanks for a chance to win, too. OH my heavens...those kitties are too cute!!! Love all the different cards using the kitty stamp. This release is absolutely fabulous! Such great projects have been showcased! What a classic vintage photo look! The gleaming confetti lights really do finish off the card spectacularly. I love the cat tree! Definitely something I need to add to my stamp collection! That cat tree is my new holiday favorite! 💕 these cat bunch! Thanks for the inspiration!